Experience The Ritz-Carlton, Los Angeles at L.A. LIVE, located at the epicenter of Los Angeles, amidst the spectacular revitalization of downtown. This boutique hotel features luxurious accommodations, dramatic, panoramic skyline views, relaxing spa services, stimulating nightlife, and exclusive access to sports, entertainment, award shows, and world-class cuisine. With convenient access to the business, financial, law, cultural and fashion districts, this state-of-the art vision also caters to the discerning business and leisure traveler a truly shimmering, champagne experience. WP24: Twenty four floors above the Los Angeles skyline sits WP24 by Wolfgang Puck. 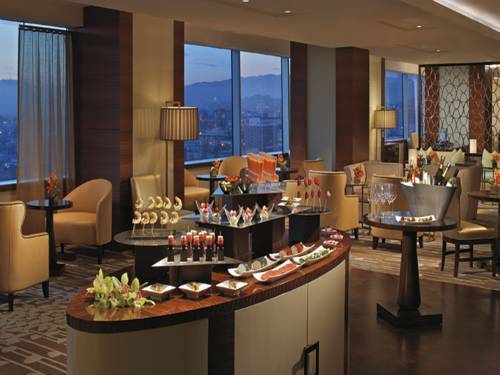 The restaurant features Wolfgang s award-winning modern Chinese cuisine. Nest at WP24: Nest at WP24 is a modern lounge experience serving a dedicated menu of Asian-inspired snacks, appetizers, sushi and large plates.